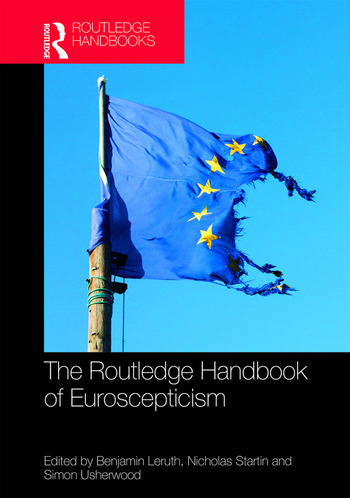 Containing a full range of thematic contributions from eminent scholars in the field, The Routledge Handbook of Euroscepticism is a definitive frame of reference for academics, practitioners and those with an interest in the debate about the EU, and more broadly for students of European Studies, EU and European Politics. Benjamin Leruth is an Assistant Professor in Politics and Public Administration at the Institute for Governance and Policy Analysis (IGPA), University of Canberra, Australia. His research focuses on Euroscepticism, differentiated integration in the European Union and public attitudes to political institutions. His publications include a Journal of European Public Policy special issue on differentiated integration (2015), a co-edited book entitled Euroscepticism as a Transnational and Pan-European Phenomenon (Routledge, 2017) and After Austerity (2017). Nicholas Startin is Head of Department for Politics, Languages and International Studies (PoLIS) at the University of Bath, UK. His research focuses on Euroscepticism and the far right in contemporary Europe. He co-founded the UACES research network on Euroscepticism and has in recent years been the co-editor for two prominent, special issues on the topic in the Journal of Common Market Studies (2013) and the International Political Science Review (2015). He recently co-edited Euroscepticism as a Transnational and Pan-European Phenomenon (Routledge, 2017). Simon Usherwood is a Reader in Politics at the University of Surrey, UK. His research focuses on Euroscepticism which has led him to co-found and organise an extensive network of colleagues across Europe, as well as working with practitioners in the EU, national government and other civil society groups. As well as numerous publications in this field, he is also very active on matters relating to the UK–EU relationship.